Shipping from France under 24 / 48h. Product Description Product Description 50th Anniversary Edition contains: - "columbo - season 1" - "columbo - season 2" - "columbo - season 3" - "columbo - season 4" - "columbo - season 5" - "columbo - seasons 6 & 7 "-" columbo - seasons 8 & 9 "-" columbo - seasons 10 & 11 "-" columbo - season 12 "- a reproduction of peugeot 403 of columbo synopsis still clad in its old beige raincoat, cigar to mouth, Lieutenant Columbo officiates at the Los Angeles Criminal Brigade. The episodes are always conducted on the principle of the reverse riddle because we know the identity of the murderer from the beginning of the episode ... Actors: peter falk audio: japanese (dolby digital 2.0 mono), italian (dolby digital 2.0 mono), german (dolby digital 2.0 mono), english (dolby digital 2.0 mono), french (dolby digital 2.0 mono),ish (dolby digital 2.0 mono) subtitles: italian, english, french region: region 2 this dvd ne can probably not be viewed outside Europe. Number of disks: 38 studio: universal pictures france release date of the DVD: November 21, 2018 duration: 5461 minutes. 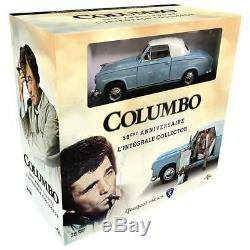 The item "dvd columbo integral edition 50th anniversary Peugeot 403" is on sale since Friday, November 30, 2018. It is in the category "dvd, cinema \ dvd, blu-ray". The seller is "around_the_clock" and is located in /leans.